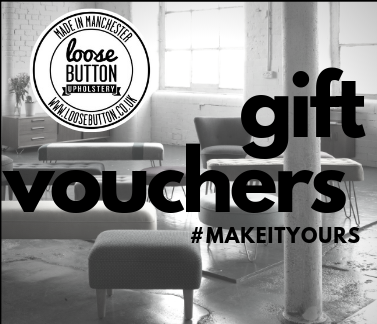 Loose Button gift vouchers make an excellent option for friends, family, colleagues and loved ones when you can’t quite decide, or want to contribute to their re-upholstery project or new purchase from our custom-made furniture ranges. It’s not always easy to decide on a gift for a friend, loved one or colleague so we have now available a choice of gift vouchers, £20, £50 & £100. Each can be used to purchase from our custom-made footstools & benches, cushions or ready to buy furniture we have made new. You can also use them towards a re-upholstery or bespoke project. Vouchers last 12 months from the date of issue so there’s plenty of time to redeem them. Select the values below, adding each one to your cart to make up the overall value. We’ll then either send you the PDF to print at home, or we can print and send out to you. We only send to the purchaser so you can organise additional messages/cards etc. Then the recipient simply needs to contact us for anything they are looking to purchase. (sorry we can’t currently deduct this online).